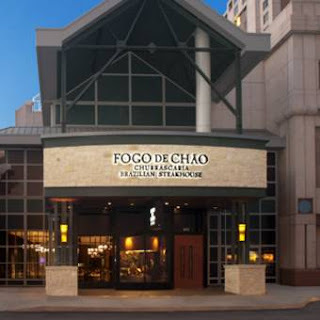 Michael and I were recently invited to have dinner at San Antonio's Fogo de Chao location to try their Southern Brazilian Steakhouse fare and their new Brazilian-inspired cocktail menu. Arriving just in time for Summer, the cocktail menu complements Fogo's 16 signature cuts of meat, which are served tableside from roasting skewers. 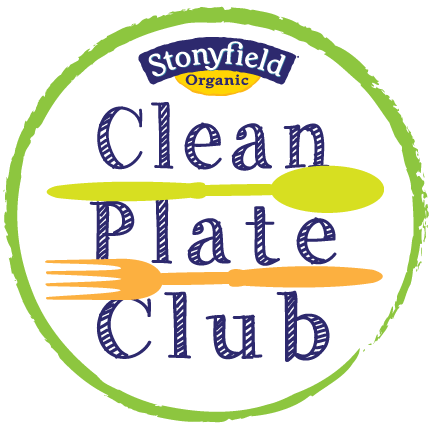 Side dishes like warm cheese bread and garlic mashed potatoes are served family style, along with a huge gourmet salad bar. Authentic Brazilian-trained churrasqueiros (aka gaucho chefs) present and slice perfectly grilled beef, lamb, pork, chicken and sausage tableside -- all cut to each guest’s preference. 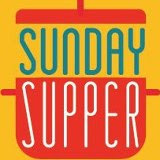 Even better it's all you care to eat for one set price! We arrived and were warmly greeted by Manager Jovani Gava. We were quickly seated and ordered a couple of the new cocktails. 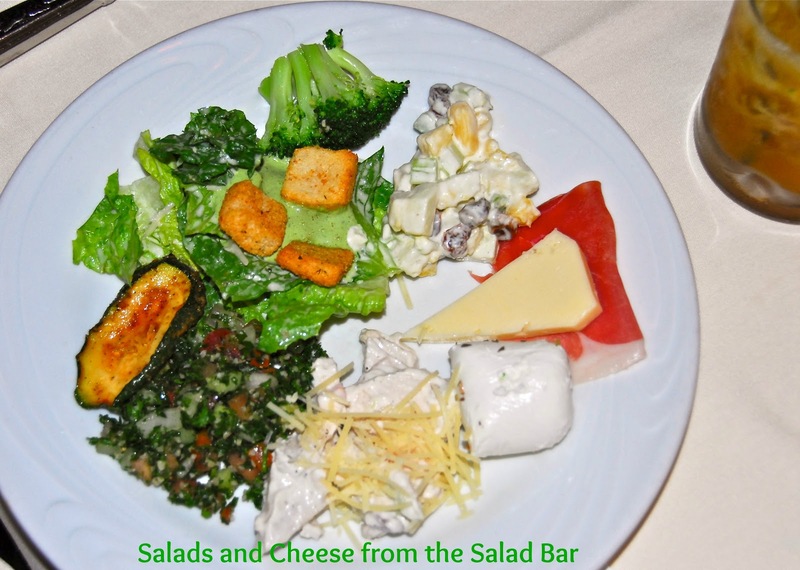 Then we visited the salad bar to check out the wide variety of salads, meats, cheeses and roasted vegetables. The salads, meats and cheeses were fresh and delicious...and they paired perfectly with our cocktails. Michael opted for the Superfruit Lemonade, and I had the Passionate Caipirinha. The Superfruit Lemonade is flavored with Veev Acai Spirit, Grand Marnier Rouge, lemon, and fresh strawberries or blueberries. Caipirinha is a classic Brazilian cocktail made with sugar, lime and a sweet rum called Cachaca. Add some passion fruit puree, and you've got a Passionate Caipirinha. 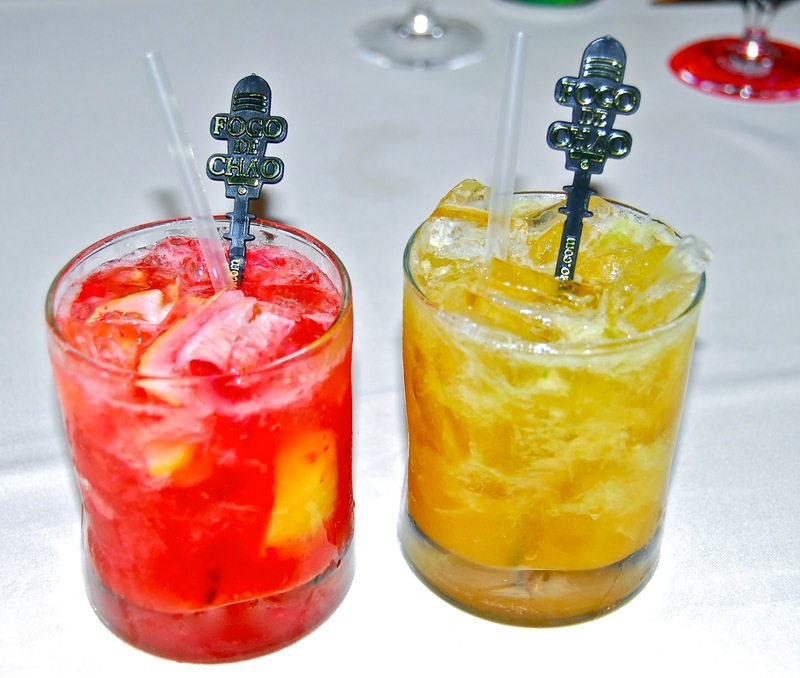 As you can see, both of drinks were fruity, refreshing and delicious! We finished our drinks and were given a round card that was green on one side and red on the other. Our hosts explained that when we were ready for the meat to start arriving, we were to put the green side up. 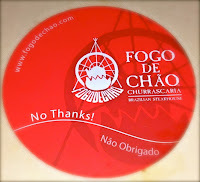 When we needed a break or were done for the night, we simply had to turn the card over to red to signal no mas. It was so much fun to learn about the different cuts of beef, pork, chicken and sausages that the various servers came by to offer us. 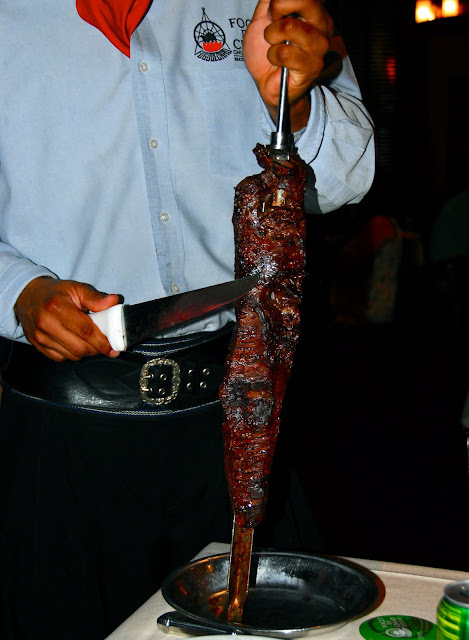 They expertly sliced the meat to our preferred degree of doneness and provided us with a lot of great information about the cooking technique's history in Brazil. Michael is a meat lover, so this kind of dining is right up his alley! 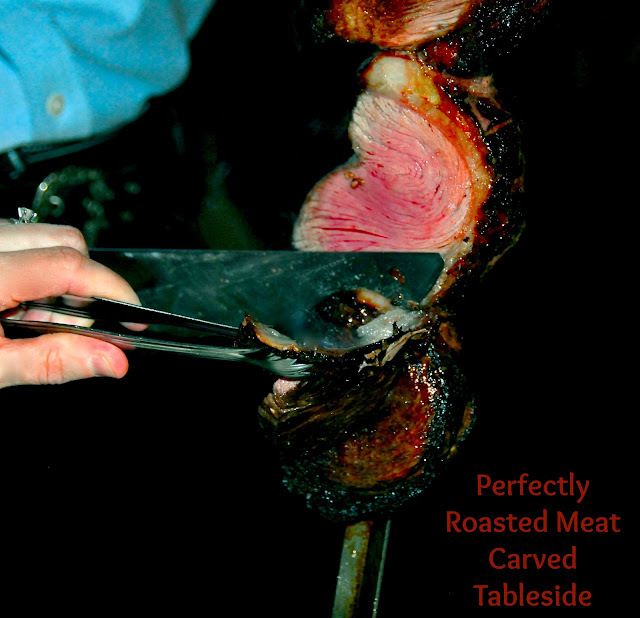 All of the meat was perfectly roasted and so juicy. However, our favorite cuts of meat were the Filet Mignon, Alcatra (sirloin) and the signature Picanha (top sirloin) cut. They were full of flavor and seasoned just enough to let the natural flavor of the meat shine through. We took our time enjoying each cut of meat, and we even opted for second helpings of our favorites. Because it's one price, we were able to do that. 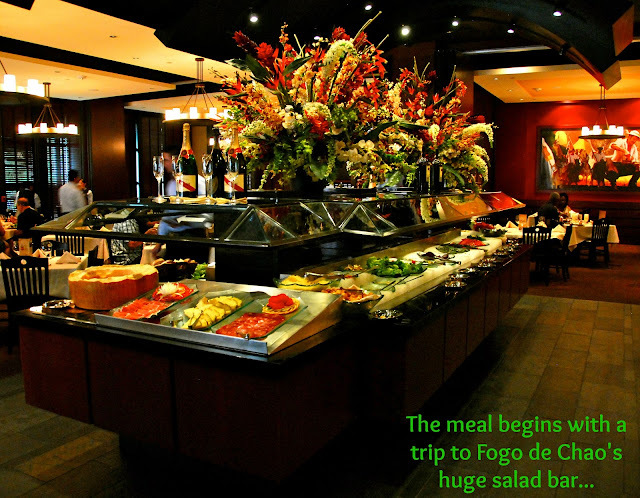 The Fogo de Chao menu price includes a variety of delicious side dishes that are served family style. 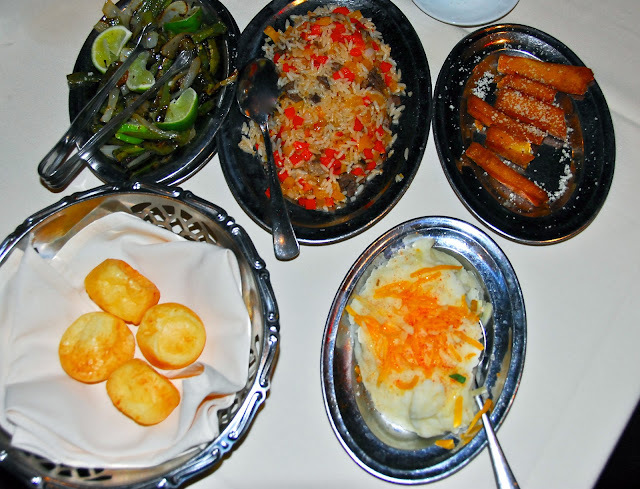 We especially loved the warm, gooey cheese bread and the fried polenta fingers. We sampled a few bites of each of the sides, but we tried to save most of our room to enjoy plenty of the delicious meats! Of course, we save thismuch room for a shared dessert. Our server recommended their creme brulee. 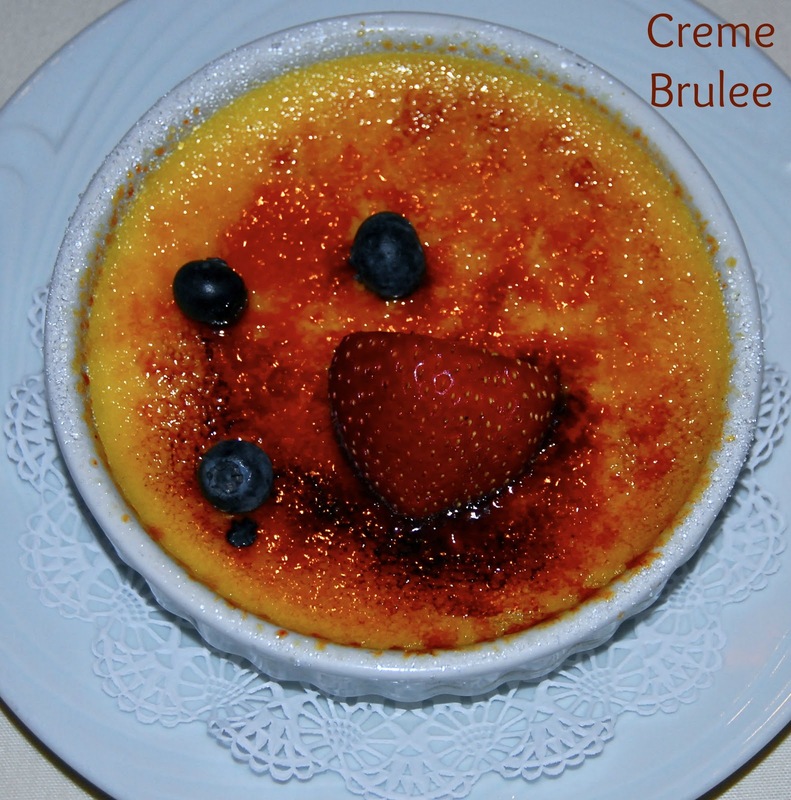 I have to confess that I'm pretty picky about my creme brulee, but our server was right. It was perfectly creamy and rich! Michael and I battled for the last bite and agreed it was some of the best creme brulee we've ever eaten. It was the perfect ending to our meal. 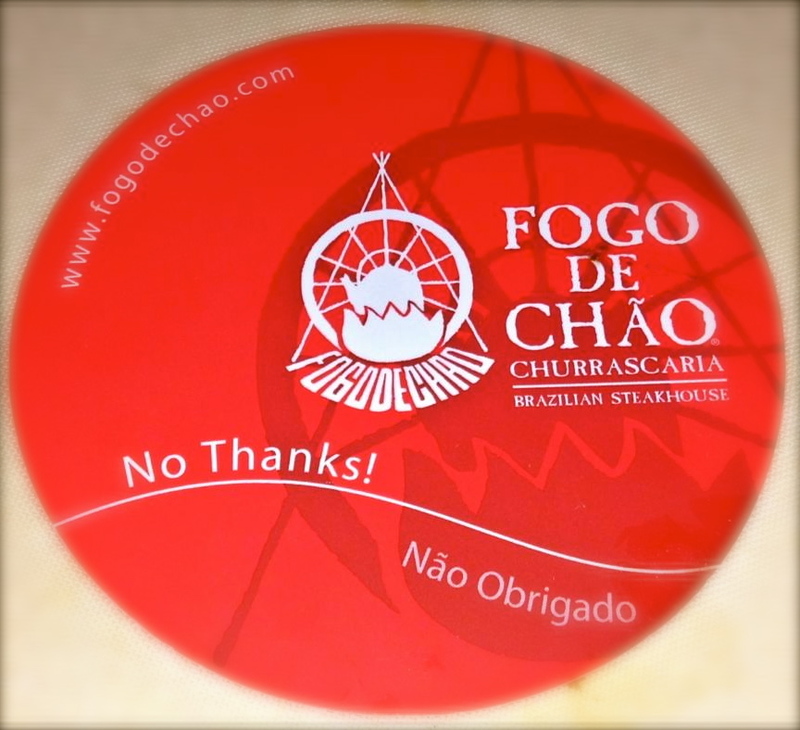 We left Fogo de Chao full and happy! 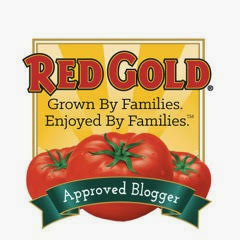 We felt that they charge a very fair price, considering both the quality and quantity of food that is served. Friendly, knowledgable staff...delicious food...and an all-you-care-to-eat policy make Fogo de Chao a great place for the carnivores in your life. For those who don't eat meat, they can order just the salad bar for a reduced price. With 30+ items to choose from, they'll find plenty to fill them up as well. Disclosure: Fogo de Chao provided us with two complimentary dining experiences, along with cocktails and dessert, to facilitate this article. The opinions expressed are my own. All photographs are copyright Michael K. Garcia; they may not be copied or shared without prior permission.